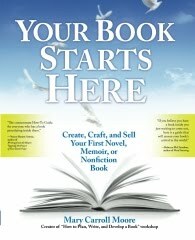 I first heard about Mary Carroll Moore's book, Your Book Starts Here!, on one of my writing friend's blogs. My friend talked about how she and another writer were working through the chapters and exercises in this book to fulfill their dream of writing a book. I became intrigued. So, I wrote to Mary and asked her if I could get a copy to share with WOW! readers. I am so glad I did. The PDF version I received is over 400 pages--this is a COMPREHENSIVE guide on how to write a book from the conception of an idea to how to get it published--including whether to go with an agent or not and information on self-publishing. In the introduction, Mary states, "With Your Book Starts Here, my goal is to help you write the book you dream of writing. I am offering you what I needed back in 1988 when I tackled my very first book. Back then, I couldn’t find even one comprehensive field guide to help me plan, write, and develop my book . . .In the chapters that follow are the very best tools I’ve culled from writing thirteen books in three genres. These tools guided me through each phase of planning, writing,and developing—and selling—my books. For the past ten years, I have been sharing these tools with students in my book writing classes and workshops. Many have used them to finish their books—and have gone on to successfully publish." And she does exactly what she promises in this book. The book is arranged in three sections: "Plan (Getting to Know Your Book)," "Write (Manifesting Your Book’s Inner and Outer Story)," and "Develop (Making Your Book Shine)," which includes chapters on the publishing world. That's what I LOVE about this how-to guide. She doesn't leave any stone unturned, and it will work for ANY book--novel, memoir, or nonfiction. The book is easy to read and easy to follow. If you are picking it up after you have already done a lot of pre-writing and are just stuck on the actual writing of the book, you can still use this guide. She states in the intro that the book can be read cover-to-cover, or writers can skip around to the parts they need when they need them. Chapters are labeled (of course), and subtitles are included for easy-to-find information; and there's a comprehensive index in the end of the book. Writing exercises are also included. Again, these are marked a certain way in each chapter, so they are easy to find; and these exercises will help you grow as a writer and make your book stronger. They make you think about things to do with your writing that you might not have ever thought about before. If you have been looking for a how-to guide to help you write a book, I highly suggest taking a look at Your Book Starts Here! Mary is a teacher who cares about writing and writers, and this comes out in her book. For more information, you can check out Your Book Starts Here! on Amazon.com. Margo L. Dill teaches two novel writing courses for WOW! "Writing a Middle-Grade Novel" and "Advanced Course: Writing a Middle-Grade Novel Part 2." Both are being offered this summer. For more information, please see the WOW! classroom or e-mail Margo at margo(at) wow-womenonwriting.com. For a full list of classes, visit the WOW! classroom at the link above. Thanks for the great review of my book! So glad you're enjoying it. Great post Margo and, of course, I love Mary's book! Mary--you are most welcome. I hope many WOW! writers can benefit from your book.